It is said that China’s first low altitude route, Zhuhai - Yangjiang �C Luoding, has officially shipped on June 26th, which marks that China’s low altitude airspace reform is entering the practical stage. At present, China general aviation is still in early stages, and only some cities has been chosen as pilot sites. Therefore, helicopter development demand and future planning will surely become a hot industrial topic. At Helicopter Outlook 2014 (hereinafter "HO2014"), XU Chaoliang, Civil Helicopter Technical Director from AVIC China Helicopter Research and Development Institute showed the current growth situation of China civil helicopter to all the attendees with introducing AVIC AC series civil helicopter, especially 3 ton one AC3X2. Besides, GAO Yuanyang, Director of Beihang University General Aviation Industry Research Center, gave a lecture, Development Trends and Investment Opportunities of China Helicopter Industry, under the Background of Low Altitude Airspace Opening, where he pointed it out that the low-altitude airspace would be gradually opened from 2015 in China. The booming of China’s general aviation required an industrial preparation period of 1-2 years. Under this background, helicopter will be the industry of China’s general aviation given top priority for development. He further emphasized that China is not only the world’s most important emerging market of general aviation, but will also turn into an important part of the general aircraft manufacturing industry chain. With the gradual opening of low-altitude airspace and the policy support from local governments, the general aviation industry of our country has developed to some extent. The general aviation market has aroused wide attention. 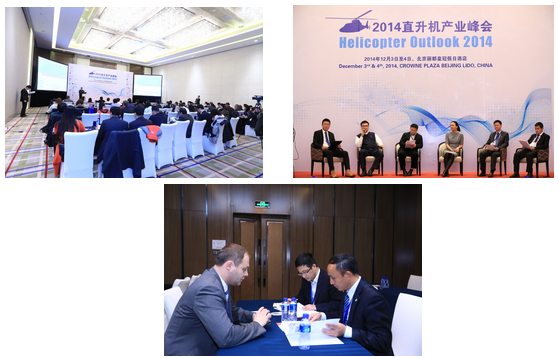 At HO 2014, CHANG Xin, Director of Marketing and Sales from Capital Helicopter analyzed deeply the topic that Storage Capacity for China General Aviation Market Development to Strengthen the Professional Operation Level through six parts such as background, safety, team, market brand, operation and future. He indicated that although status quo of general aviation market existed some shortcomings such as poor operation ability, difficulty in earning profit, etc, general aviation market would boast infinite development potential under favorable policy, local support and international cooperation. In the case of safety, he said that The general aviation enterprises of China should fully learn the safety management experience from the international civil aviation organizations and advanced foreign general aviation companies, comprehensively grasp the safe production and management development trend, constantly improve and implement the safety policy and standards, and set up a perfect long-term mechanism to build an active and preventive safety management model. Aviation rescue which has a close relationship refers to the process where a team composed of professional medical workers and flight crew members and equipped with special aircraft and equipment provides emergency medical treatment and transport for victims suffering from life-threatening injuries. Thus, HO 2014 also covered the topic of aviation rescue. It was honor of Galleon to invite Mr. CHEN Ping, Executive Deputy Director-General of Emergency Rescue Center of Civil Affairs in China, delivered the first speech that China Aviation Rescue Prospective: Specialization and Industrialization where he introduced to attendees in detail that Aviation rescue specialization in simple terms means that professionals engaged in aviation rescue should have specialized knowledge and use specialized equipment required for emergency rescue. Aviation rescue is widely recognized as the most important means because of its unrivalled high efficiency. From the industrial perspective, aviation rescue is a capital-, labor- and technology-intensive sector. Therefore, in the field of aviation rescue and during the whole development process of aviation rescue, all aspects, ranging from fund raising and capital operation through equipment procurement to specific rescue missions, require professionals and expertise of various kinds. HO 2014 specially launched a panel discussion named as Meet Challenges and Overcome Difficulties in Air Emergency Rescue where attendees which brought HO 2014 into another climax. Besides, HO 2014 also set up onsite booths for attending enterprises showing their own products, among these, German EuroAvionics Corp. exhibited there EuroNav7 navigation equipment that would guarantee aviation rescue which got high attention from domestic and foreign delegates through showing their simulation product sample and rescue route planning. Moreover, which should be emphasized was the organizer of HO 2014, Galleon, had cooperated with BizAsia, CCTV News. At HO 2014, regarding the development trend and challenge of China civil helicopter, BizAsia reporter had interviewed GAO Yuanyang, Director of Beihang University General Aviation Industry Research Center, gave a lecture ; CHANG Xin, Director of Marketing and Sales from Capital Helicopter; ZHANG Jianye, China Regional Sales Manager of AgustaWestland. HO 2014 has lasted for one and a half days which has gathered industrial leaders from official government, main helicopter OEMs and helicopter operators. Let’s look forward to next section, and it will bring you a fresh and new audio-visual feast.